COMPANY PROFILE Multi Commodity Exchange of India Ltd is a commodity futures exchange. The company facilitates online trading, and clearing and settlement of commodity futures transactions, thereby providing a platform for risk management. Multi Commodity Exchange of India Ltd is an India-based deemed Stock Exchange recognized under the Securities Contracts (Regulation) Act, 1956. The company facilitates online trading, and clearing and settlement of commodity futures transactions, thereby providing a platform for risk management. The company is a demutualised Exchange and has permanent recognition from the Government of India to facilitate nationwide online trading, clearing and settlement operations of commodity derivatives. The company derives its revenues from transaction fees, admission fees, annual subscription fees, terminal charges, connectivity income, interest income, dividends from and gains on the sale of investments, and other miscellaneous income. 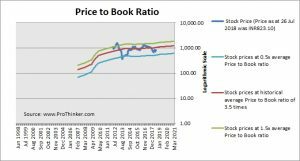 At the price of INR823.10 as at 26 Jul 2018, Multi Commodity Exchange Of India Ltd is trading at a Price to Book Ratio of 2.9 times current book value. 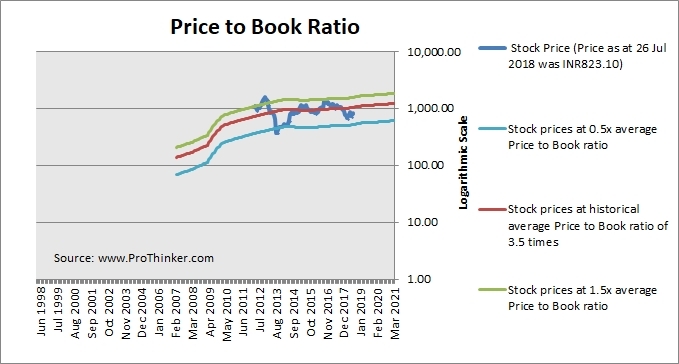 This is a 16% discount to its historical average Price to Book Ratio of 3.5 times.